A mysterious job offer leads Holmes and Watson on a new adventure. 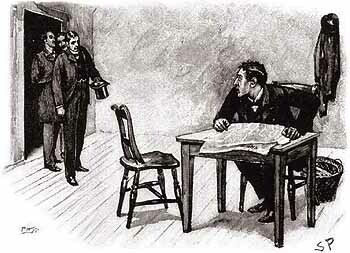 A young stockbroker called Hall Pycroft consults Holmes after a company has offered him a very well-paid job. On the train to Birmingham where the job is based, Pycroft explains that he recently secured a job with another stockbrokers in the City. Before his first day, he was approached by Arthur Pinner, who offered him a managership with a newly established hardware distribution company, to be based in France. Pycroft travels to Birmingham to meet Pinner’s brother where he is offered a very well-paid post with one hundred pounds in advance but must not to send a letter of resignation to his would-be employers. Pycroft’s suspicions grow and are fuelled when he notices that the two Pinner brothers both have a distinctive gold filling in their teeth in the same place, suggesting that they might be the same man. A strange job offer that is too good to be true, this story is reminiscent of The Adventure of the Red-Headed League. The scene in which the brother attempts suicide caught me by surprise and was a case where crime doesn’t pay. Overall, while it reminded me of other stories, I though this was one of the stronger ones.